What has director David Lynch been up to, you ask? That bastion of all things weird and wonderful nabbed his 4th Oscar nomination for 2001’s dreamy Mulholland Drive, then kind of disappeared. Well, weep not for David Lynch, for he is living the dream – my dream, anyway. He’s been hanging out with Duran Duran, piecing together a documentary of the best looking boy band ever. Their collaboration, Duran Duran: Unstaged, is a concert doc like no other. Lynch filmed the band’s live show at the Mayan Theater in Los Angeles, a gig that kicked off their world tour in support of the 2010 album All You Need is Now. Now years removed from the arena tours of the Eighties, the band put together an intimate, strong stage set for this club tour. Lynch later retooled the footage for the theatrical release. The gig itself – quite unlike the tour that followed – relies heavily on songs from the current album at the expense of many of the band’s sing-a-long Eighties tunes. But frontman Simon LeBon is in excellent voice, and luckily, All You Need is Now is quite a strong effort. While the group does launch into the biggest fan favorites – Rio, Hungry Like the Wolf, Girls on Film – they also fall back on some album cut gems that should thrill longtime Durannies. They also pull out their more underappreciated later hits Come Undone and Ordinary World to beautiful effect. The event boasts a handful of cool guest appearances, including My Chemical Romance’s Gerard Way on a fun version of Planet Earth, and Gossip’s Beth Ditto, with a lively duet for Notorious. 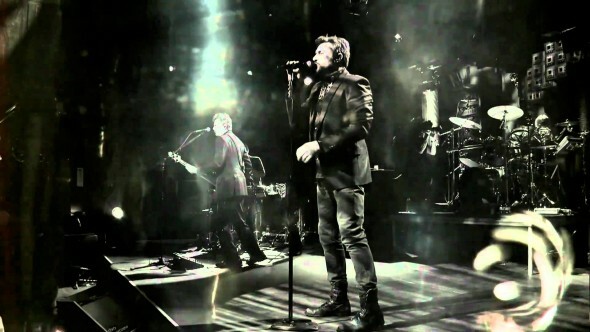 These join four of the band’s original five: LeBon, Nick Rhodes on keyboards, Roger Taylor on drums, and John Taylor on bass. But the 5th member of the band is clearly Lynch. Directing a concert documentary can be a thankless, mostly anonymous task. Did you really notice Hal Ashby’s presence during the Stones’ doc Let’s Spend the Night Together? Did even the great Scorsese leave his fingerprints on the same band’s 2008 doc Shine the Light? Well, you notice Lynch. The auteur overlays tangentially connected images on concert footage in a fashion truly his own. The images range from the absolutely literal to the wildly random, either way lending an air of absurdity to the otherwise straightforward set. A dreamlike dissonance marks Lynch’s entire film career (with the possible exception of his utterly lovely ’99 effort The Straight Story), and that’s certainly at work here. Sometimes it seems to gel, other times it stands out as almost needlessly bizarre and silly, but who’s to question the inspiration of David Lynch? It’s certainly a different way to appreciate Duran Duran.